Jack Alexander Gertz, 83, a former Washington bureau chief for the old Mutual Broadcasting Co. who became a public affairs officer at American Telephone & Telegraph Co., died of kidney failure December 16 at his home in Potomac, Maryland. He worked at MBC from 1954 to 1959 before joining the Federal Aviation Administration for three years as chief of its public affairs office. He then worked at AT&T from 1961 until he retired in 1985 as executive director of public affairs and media relations. Mr. Gertz was born in Chugwater, Wyoming, and was a newspaper and radio reporter in Denver in the 1930s. From 1951 to 1953, he worked at the State Department in the South Pacific as a public affairs director and then a vice counsel. During World War II, he served with the Marine Corps in the Pacific theater. He retired from the Marine Reserve as a colonel in the early 1990s. He served on the National Commission for Employment Policy in the 1980s and was on the board of Columbia Hospital for Women. He was a member of the National Press Club, Army and Navy Club, White House Correspondents Association, Radio-Television News Directors Association, Sigma Delta Chi journalism fraternity and the International Club. Survivors include his wife of 51 years, Dorothy O. Gertz of Potomac; a daughter, Kathryn J. Zugby of Oakton; three grandchildren; four great-grandchildren; a brother; and three sisters. 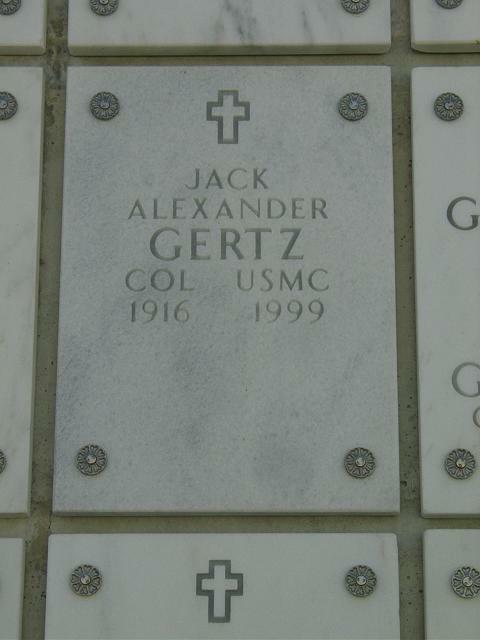 On December 16, 1999, at his residence, beloved husband of Dorothy O. Gertz (nee Quall); devoted father of Kathryn J. Zugby of Oakton, VA; loving grandfather of three grandchildren and four great-grandchildren; dear brother of Milton Gertz of Denver, CO, Sarah Dawson of Denver, CO, Diamond Blumberg of Whittier, CA, and Ida G. Cohen of Rancho Mirage, CA. Also survived by several nieces and nephews. Services will be held at the Ft. Myer Chapel, Arlington National Cemetery on Thursday, December 30, at 11 a.m. In lieu of flowers, please make donations to the American Diabetes Association, 1211 Connecticut Ave., NW, Washington, DC 20036, or the Montgomery Hospice, 1450 Research Blvd., Suite #310, Rockville, MD 20850.